The duchy is a new non-profit artist run gallery and studio space located in two adjoining shopfronts on Duke Street, Glasgow. Our intention is to support emerging and early career artists committed to their practice, providing space to create and show work. A collective of jewellers, ceramicists, textile artists and painters. The Glasgow Ceramics Studio is a an artists' cooperative of eighteen ceramic artists. Pilates with Gillian is a physiothetapy-led modified Pilates class instructed by Gillian O’Kane, a fully qualified Chartered Physiotherapist trained through the Australian Physiotherapy & Pilates Institute (APPI). Classes are on Saturday mornings 10-11am, are 1 hour long and run in 8 week blocks, bookable in advance. Qualified yoga instructor in Ashtanga yoga and vinyasa flow. Easy exercise classes where everyone aged 60 and over are welcome to join. This is a FREE physical activity initiative organised by the East Glasgow Community Health and Care Partnership. Classes are designed with you in mind to help you improve strength, stability, mobility and increase self confidence. There is also a free Arts & Crafts class at Whitehill Pool (Mon 12-1pm). Whitehill Pool is a popular community facility that has undergone a recent refurbishment. Along with a 25m pool and all the modern gym equipment you could wish for, there’s also a full timetable of fitness classes in the dance studio. Pump & Burn - Buggie Pump classes at Alexandra Park. Group fitness training. Come along to any of our classes or contact us for more information. Informal photography group based in Dennistoun. Lodge Scotia No.178 includes office bearers, history, meetings, pictures and contacts. The club is open to the public on Saturday and Sunday afternoons. 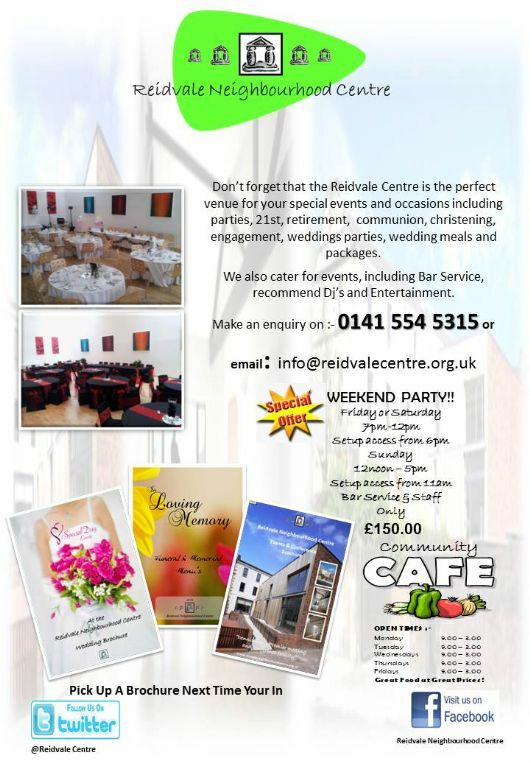 The club can be hired for private functions on Friday, Saturday and Sunday evenings. The Main Hall is available on Saturday and Sunday afternoons for christenings and communions. The Main Hall is also available Monday to Saturday to cater for funerals. Private hire is not open to the public. We also do a full wedding package. Why not give us a call or pop in at any time Saturday or Sunday with your enquiries and have a look around our newly refurbished premises. The club would like to welcome anyone interested in joining an East-End football club playing at amateur level. We play on a Saturday afternoon and train at Whitehill Secondary on a Tuesday evening at 7 pm. Players are welcome to come along and train alongside us either for getting fit or to play. Dance classes on Fridays from 4.30pm onwards from age 3 years upwards in Ballet, tap, streetdance, cheerleading, acrobatics, jazz and highland. Fully qualified coaches in all subjects taught. Cheerleading squad training on Saturdays. Dance school based in Whitehill Secondary School on a Monday Night from 6.30pm-9.30pm We are a competitive dance team in Cheerleading, Hiphop, Jazz and Arcobatics. Dance classes for children & adults in varies styles of modern dance. Mondays 3-11yrs, Tuesdays 12-Adult. Zumba class Tuesdays at 8-9pm. Wednesdays Modern Stage Exams and Street Dance Classes. For further information please contact Jaqui on 07837 496734 or Nicola on 07773 407749. Pulse Dance & Theatre Arts is an innovative and exciting school run by Jacqueline & Nicola Duffy, which has been based in Glasgow's East End for the last 18 years. We offer fun and diverse classes in various dance styles including jazz, contemporary, streetdance and rock and roll. We also run a Glee Club offering tuition in singing, acting and dancing and have recently started a DanceFit class specifically for adults. Prices are extremely competitive and all classes are taught by highly qualified and experienced professionals who are fully CRB checked and first aid trained. Beauty salon, Gym & Hair salon for CityPark businesses and the local community. The East End Healthy Living Centre is a community-led partnership, providing people living in the East End of Glasgow with opportunities to improve their physical, mental and social wellbeing. The East End Healthy Living Centre, is located in what was the Crownpoint Sports Centre. Open to all Dennistoun residents to come along and try out rowing. It's a great way to get fit, meet new people and experience the thrill of competition! We welcome all ages and abilities, so you don't have to be fit to start. Visit our website to find out more. Go on, try a gold medal sport! An invitation to visit Scotland's oldest rowing club in continuous existence based on the River Clyde is offered to all Dennistoun residents to introduce them to the sport. We are a voluntary organisation and have been established for 30 years to promote and manage the teaching, knowledge and practice of swimming skills. Swimming club for people with a disability. For all your travel requirements, Short Breaks, Flight Only, Package Holidays, Cruises or Accommodation only from Scotland to any Worldwide Destination call your local Personal Travel Counsellor. Winner Queens Award for Enterprise. Travel Counsellors Trust guarantees complete financial protection on every booking.